Some Things To Think About As You’re Getting Started. What area of your home are you looking to update? Are there any particular products that interest you? What are the dimensions or square footage of the area you’re looking to update? Have you thought of a budget? Do you know the style or color options you have for the various products available? Decide what area of your house you want to renovate. For flooring, measure the length and width of the floor in each room and be sure to include closets. 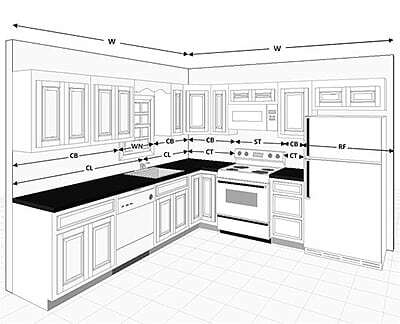 If you are needing new kitchen cabinets, measure the length of the walls and note location of windows, doorways and appliances. In the bathroom, measure the size of your current vanity or if you’re looking to change the size, measure the wall space available for a new vanity. It’s also a great idea to take some pictures of your current space. Bring your measurements and pictures with you and stop by our store and showroom. You can shop our warehouse full of in-stock and special order flooring products from carpet, laminate, vinyl plank, rolled vinyl and tile. In the showroom you will find displays with all of the door styles and color options for kitchen and bathroom cabinetry. There you can work with a designer to create a new layout and 3D computer rendering of your kitchen or bathroom. We will provide you with an estimate to complete your project. Once you finalize the design and decide to move forward, we will visit your home and double check the measurements before your order is placed. We work with you and can be involved as much or as little as you need us to. You can just buy the cabinets or flooring and do the installation yourself or we can coordinate the tear out and installation of your new flooring or cabinets. Then when your project is complete, we hope you enjoy showing off your new flooring, kitchen, or bathroom!